Attention all math teachers. Have you ever wanted to create, print, and demonstrate graphs in your classroom? If so then using Desmos would be an awesome web 2.0 tool for you to look into. This graphing calculator can graph anywhere from simple to complex graphs. Just add the formulas and the graph will appear quickly. You can then save, print and share your graphs via email, website or your classroom blog. 2. When you first arrive click the "Launch Calculator" button. 3. On the left hand side, enter the mathematical formulas you want to demonstrate to your class. You will notice your graph on the write appear as you type in the formula. 4. If you want to save the graph, you will need a user login. Just click the "Create" button at the top. Now in the "Untitled Graph" text box found just above your graph. Give your graph a title and click the "Save Graph" button. I also really like the fact that you can save the graph into your Google Drive which will then give you a whole bunch of different sharing methods. 5. One of the really neat ideas about Desmos is that if you use a Smartboard in the classroom or any other type of Digital Whiteboard, you can use the input tool found at the bottom of the screen. This will help you to continue to stand in front of the class while giving instructions on how to use the graph. 6. If you don't see the Desmos keyboard, then just locate the minimized button at the bottom that looks like the picture below. Click it and the number pad will reappear. 7. Now if you want to print or share you graph, just locate the options in blue at the top right corner of your screen under you login name. To print, just click the "Print" icon. To share just click the "Share" icon. 8. After clicking the "Share" icon, you will first see a link that you can use to link to your graph. If you would like to embed the graph into your blog or website, just click the "Embed" button and then copy and paste the code into the HTML portion of your website. An example of an embedded image is at the very end of this blog post. Finally you can click the "Image" button which will allow you to save the image so that you can use it wherever you would like. 9. Just past the print and share buttons is the "wrench" or "settings" button. This will give you some advance options for your graph. One of the options that is a fantastic idea is the "Projector Mode" button. This will make the lines of your graph darker and thicker so that the lines are more visible to your students. Desmos is truly an easy solution for demonstrating how to graph. Get as complex as you want. 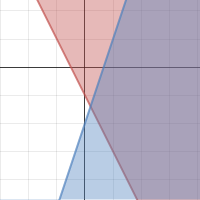 Here is an example of an embedded graph from Desmos.